Reading and share top 7 famous quotes and sayings about Frailty Of Life by famous authors and people. Browse top 7 famous quotes and sayings about Frailty Of Life by most favorite authors. 1. 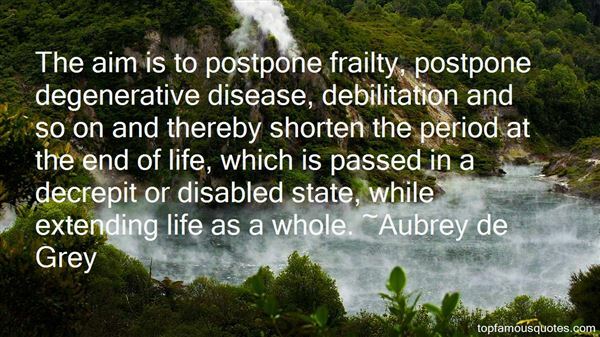 "The aim is to postpone frailty, postpone degenerative disease, debilitation and so on and thereby shorten the period at the end of life, which is passed in a decrepit or disabled state, while extending life as a whole." 2. "You live as if you were destined to live forever, no thought of your frailty ever enters your head, of how much time has already gone by you take no heed. You squander time as if you drew from a full and abundant supply, so all the while that day which you bestow on some person or thing is perhaps your last. 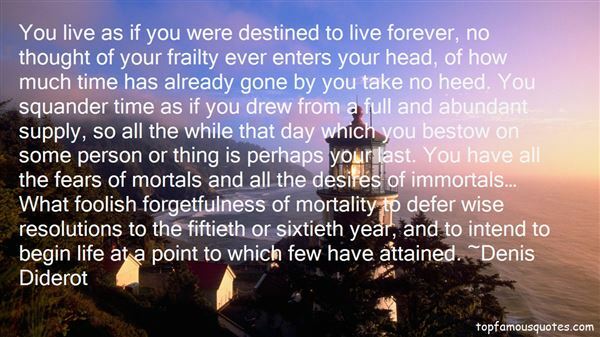 You have all the fears of mortals and all the desires of immortals… What foolish forgetfulness of mortality to defer wise resolutions to the fiftieth or sixtieth year, and to intend to begin life at a point to which few have attained." 3. "Clusters of distant lights was the view of Mankind that he liked the best. The lights had the archaic charm of little fires on a plain, and the frailty about them, if it did not excuse anything, at least explained a lot of Man's stubborn ruthlessness. Mankind had not started the mess that was life, after all. And on the whole, it had been an interesting species to be a part of, the girls especially, as long as you remembered to watch your back." 4. "In uncertainty I am certain that underneath their topmost layers of frailty men want to be good and want to be loved. Indeed, most of their vices are attempted short cuts to love. When a man comes to die, no matter what his talents and influence and genius, if he dies unloved his life must be a failure to him and his dying a cold horror. It seems to me that if you or I must choose between two courses of thought or action, we should remember our dying and try so to live that our death brings no pleasure to the world." 5. "All the expressions that are possible crossed its face, as if its thoughts were wise and limitless one moment, daft and animal the next. And Liga too was pulled towards awe, that this little girl-thing gave off such an air of being entitled, and then towards pity at its abjectness and its frailty and-how soft it was, the surface of it, and so warm! She could not believe the tiny makings of its mouth, or its perfected eyelashes, its ears like uncrumpling buds, all down and tenderness. She was full of the joy of her father being gone-that she could sit like this all night if she wanted, not bothered or harangued, without a remark from any other person, and watch this creature busy with its morsel of life, its scrap of sleep, its breaths light as moth-wings lifting its narrow red chest." 6. "Reason is an outcome of frailty and resentment. When Will fails to cope with the labour of life, or the life of labour, its fragile remnants are set to construct a slighter world of justifications." 7. "Love and faith are not common companions. 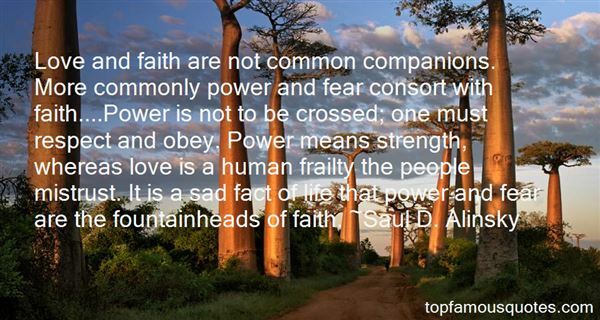 More commonly power and fear consort with faith....Power is not to be crossed; one must respect and obey. Power means strength, whereas love is a human frailty the people mistrust. It is a sad fact of life that power and fear are the fountainheads of faith." This was the place where someone had led her, only she could not remember who and could not remember when. Just that this was where she was now."